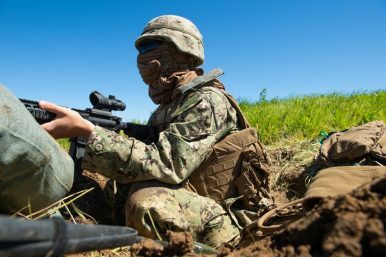 A Seabee assigned to Navy Mobile Construction Unit 5 stands watch on Marine Corps Base Camp Pendleton, California as part of Exercise Pacific Blitz (PacBlitz19). Ten thousand sailors and marines from the U.S. Navy’s Third Fleet and U.S. Marines’ I Marine Expeditionary Force recently completed a two-week exercise in Southern California to explore new concepts for fighting in littoral environments among small islands like those in the found in the South and East China Seas. “Pacific Blitz” combined existing large amphibious and logistical exercises for the first time to more realistically demonstrate the “Littoral Operations in Contested Environments” and “Expeditionary Advance Base Operations” concepts that the U.S. Navy and Marine Corps unveiled in 2017. Traditionally, the focus of amphibious operations is on land, and once marines are ashore, the navy shifts to support those landward objectives. But now that peer adversaries are fielding larger and more capable navies and long-range anti-ship weapons, it is increasingly the navy that may have to rely on the support of other services to maintain control of the seas and support logistics requirements deep in contested territory or waters. Reflecting that evolving emphasis toward supporting the navy, during this year’s exercise primary control of operations was not transferred to the marines once they were ashore, as is typically done. Instead, the marines remained under the navy’s control and worked for the primary navy warfare commanders in charge of mission areas like air defense and anti-surface defense. Signaling the importance of this shift in how amphibious operations will be conducted and for what purpose, the heads of both services, Chief of Naval Operations Admiral John Richardson and General Neller, observed the exercise together. The exercise also demonstrated re-arming a destroyer under expeditionary conditions. U.S. cruiser and destroyer’s Vertical Launch System launches anti-air, anti-ship, and land attack missiles as well as rocket assisted torpedoes. Typically, those vertical batteries must be reloaded at established naval arsenals. In a naval conflict in the East or South China Seas, that could require warships to return to Japan or Guam to rearm their primary weapons systems. During the exercise, an Expeditionary Reload Team simulated an expeditionary environment by embarking a landing craft with their equipment at Naval Weapons Station Seal Beach and then reloaded the USS Michael Murphy with SM-2 anti-air missiles, a task normally done by dedicated weapons station personnel. Translating these concepts to a conflict scenario, U.S. Marines might establish an expeditionary advance base at which expeditionary reload teams could rearm destroyers and cruisers that had expended their vertical launch tubes so they could return to the fight faster. The same concept is also envisioned to be used to support and rearm aircraft. In a separate exercise this month, U.S. Marines and Army Special Forces practiced establishing an expeditionary advanced base on Ie Jima, a small island near Okinawa in Japan’s southwestern islands. Marines and soldiers flew 600 miles, simulated seizing an airfield and turning it into a refueling and rearming base for F-35 jets, and then broke down the base and flew to conduct another long-distance raid. While the U.S Navy and Marines say that the Littoral Operations in Contested Environments concept is intended for less intense combat environments, in concert with other advanced capabilities the services are pursuing, it also appears applicable to potential high-end combat operations against an adversary like China. In the South China Sea or among Japan’s southwestern islands, the U.S. Navy and Marine Corps – with potential long-range fire support from the U.S. Army – might apply these littoral concepts to establish temporary loci of sea and air control in support of larger theater objectives.